Foodista | Pork: How Will You Be Inspired? Earlier this week, the National Pork Board launched a new advertising campaign - "Pork: Be Inspired." After over 25 years of comparing pork to chicken as "The Other White Meat" it seems the Board has decided it was time to embrace our differences and exalt pork for being, well, pork. With over 82 million consumers, it is high time to target the army of bacon lovers instead of trying to convert Americans away from chicken or beef. While beef ("It's What's For Dinner") has a long-established history as the "star" of the American meal, one of the major recent trends in American dining is diversification. From alternative grains to unusual vegetables, why not give meat a makeover too? So how will you be inspired? In our home, pork is not the other white meat, it is the only white meat since my husband does not like chicken. As parents of two teenage boys, we cook with a lot of pork. 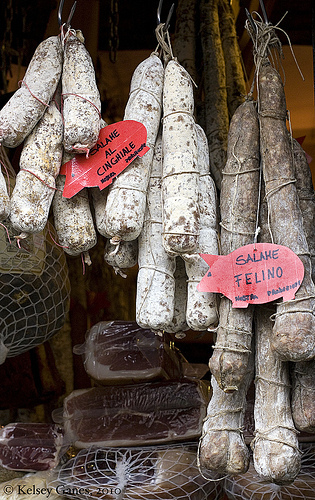 Many classic Italian dishes use pork or bacon like Pasta alla Amatriciana, Carbonara and Pork Saltimbocca. We even make our own sausage. Check out our blog site for lots of recipes for pork. I'm lucky enough to never have to purchase pork in the store. My farmer (he's my significant other, AND a farmer!) and I will be butchering three pigs this coming weekend, and while I don't relish the very first step in this process (I refuse to be present, actually) I really love the rest of it - cleaning and cutting the meat, making sausage, and wrapping it all for the freezer. I can't wait to make pork loin stuffed with dried prunes and apricots and garlic, pork chops on the grill, and pineapple-roasted ham. Breakfasts will be filling again, with sausage and bacon to prepare with our eggs, or the occasional ham steak. For us, there's no comparison between pork or any other meat - when the table is set with a meal we've raised ourselves, the food is extra satisfying!